Lately Deadly Knitshade has been dreaming of spiders. Huge hairy ones with fangs and an evil glint in their many eyes. Spiders and I have come to an agreement. If I don’t harm them, then they won’t crawl into my ears at night and lay eggs so their babies can eat my brains. Fair enough. 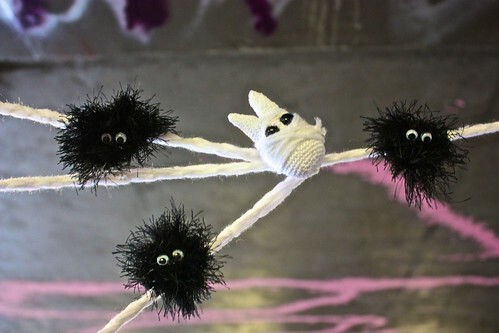 So when the rest of the Knit the City Yarn Corps and I sat down to bring to life (and all kinds of death) our Web of Woe, I knew very well that sacrifices had to be made to the hungry stitched Spider. Amongst these offerings I made a mouse. He was a mouse of skinny arms, of beady eyes, of flappy feet and pink ears. He was trusting, he was soft and pudgy, he had no idea what fate awaited him. The day of Yarnstorm the Fourth arrived. The six members of the Knit the City Yarn Corps gathered. We approached the target. 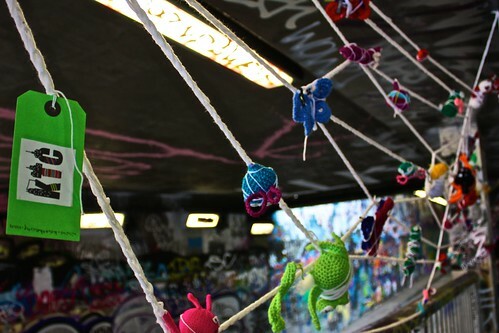 We yarnstormed Waterloo’s Leake Street tunnel with our Web of Woe. 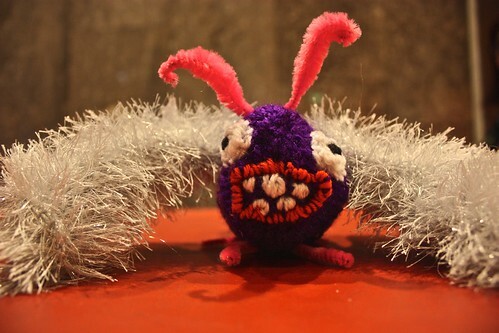 The mouse peered up with his shiny trusting eyes as I drew him from the bag of knitblast. I hardened my heart, tied him in place and I walked away. Returning to the scene of our sneaky stitching that evening the Yarn Corps were horrified to catch knit graffiti theives in the act of stealing! They held, in their grubby yarn stealing paws, not only our spider but my horrified and lately abandoned mouse. Indignant I snatched him back from his abductors. The mouse was saved. He trembled quietly in my hand as I ferried him back to the web. I looked at my mouse. He looked up at me with his beady eyes. The spider did without his rodent-flavoured pudding. My mouse and I went to the pub. There he recounted his tale and we made amends over beer and a packet of Mini Cheddars. Perhaps the heart of Deadly Knitshade is not so dark after all. 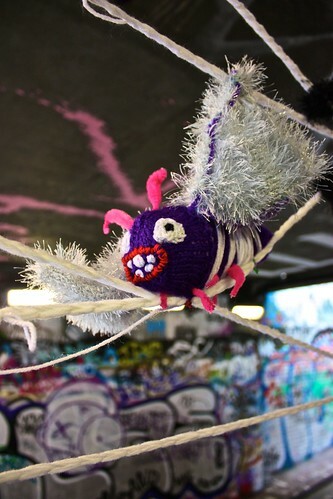 The Web of Woe has (I am told) now disappeared from the Leake Street tunnel, not 24 hours after it was weaved. My mouse, sole survivor of the Web, has been relocated until it is time for his testimony to be heard. He lives under an assumed name. Last I heard he was sailing down the Thames aboard a fine floating vessel. 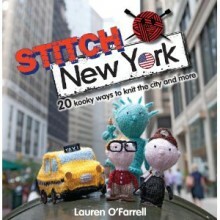 Read the full Knit the City Web of Woe tale here. oh deadly knitshade, you break my heart! sniff, sniff…poor mouse, poor deadly knitshade. I absolutely LOVE this. You are so creative, Deadly Knitshade, and perhaps “faintly disturbed”???? I say this because I wonder if we are somehow related…. Awww shucks. Mothra (RIP) and I thank you. Maybe we are faintly related, if you find you fainty disturb people too. It could be like an old episode of Dallas involving amnesia, aliens and a mix-up at the hospital due to a mysterious fire.